Most times, an idea for a painting comes upon me gradually: bits and pieces forming in my head based on current interests. I will sketch it out then change it, let it sit for awhile and change it again until it is ready to be painted. Sometimes however an idea springs out of the ether: inexplicable and undefinable yet I know absolutely that it is right and needs to be painted. These for me are the most exciting projects, they are almost gifts from beyond. I never think they will appeal to anyone else but sometimes I am proven wrong. Uncle Omelette was a perfect example of this. To this day I do not know how he arrived in my mind or from where his name sprang. 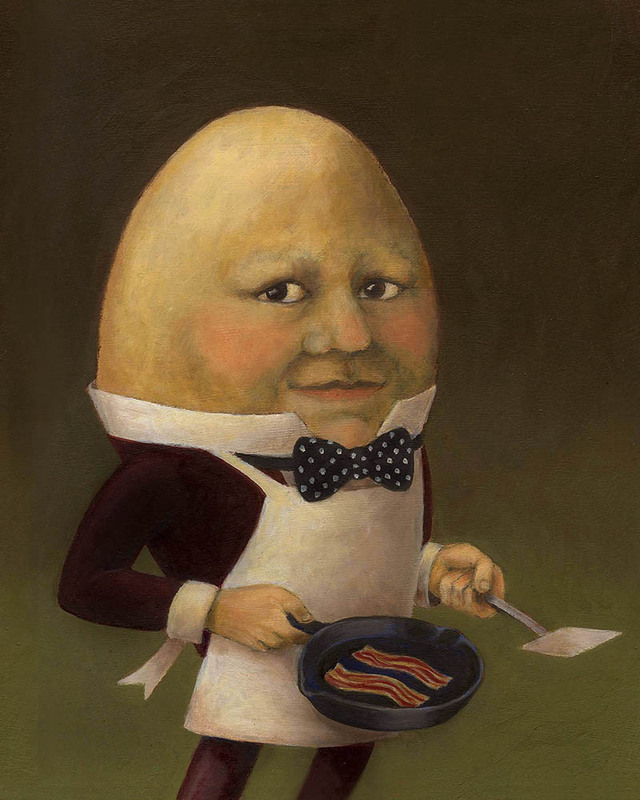 I don’t know why he is an egg, nor why he is cooking breakfast. The idea simply came to me in that fertile time right before I get out of bed in the morning when my daydreams are at their best. I awoke, sketched him out immediately and knew he was ready to paint. He has remained one of my most loved portraits. Perhaps the fact that he is an egg shows his vulnerability and his act of cooking breakfast is proof that he is a caregiver. (One of my dear friends even suggested he is a portrait of my ideal mate). A few years ago I decided to list him in my Curious Portraits shop on a whim really. I never believed he would sell even one print. To my surprise he has become one of the most popular characters in the shop. I even have customers write me to say that he reminds me of their bald boyfriend or husband or that they are buying the print as a gift for a cook. It pleases me no end when others see the good in him and want him hanging on their wall. I have often wanted to paint another egg man but the sketches never came to life and I had put the idea aside. A few weeks ago though this image of a child egg came to my mind in a similar fashion as that of Uncle Omelette. 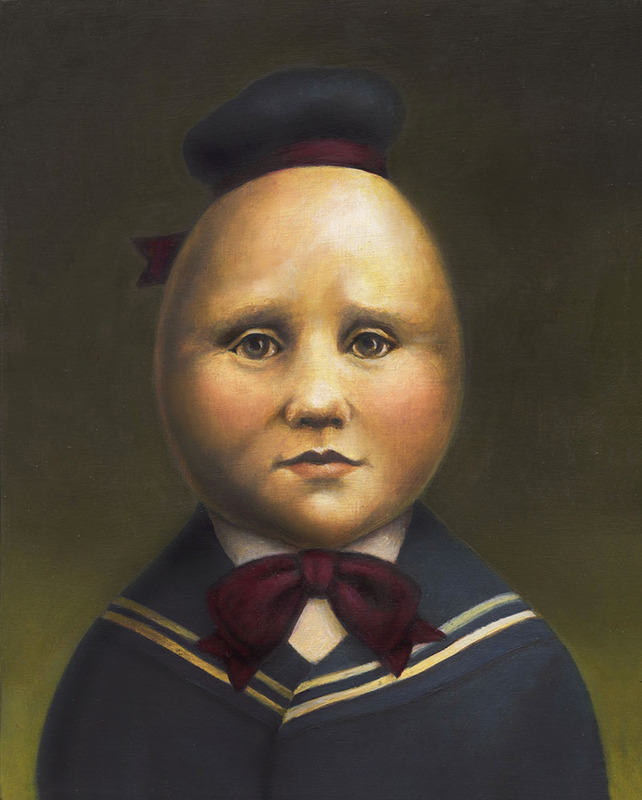 I saw him clearly in my mind, this orphan egg with a melancholy expression, dressed in an old fashioned sailor suit . I don’t really know how he relates to Uncle Omelette but I’ve come to love this little fellow and I feel somehow that he is content hanging on my wall next to Uncle Omelette.